Goodyear Tire unveils Eagle Exhilarate, its new game-changing, ultra-high-performance tire that delivers on consumer demands, particularly wet performance. The all-new Eagle Exhilarate will offer outstanding traction and handling for faster acceleration, precise steering and the ultimate in control, outpacing its segment in wet handling, wet braking and wet cornering grip. 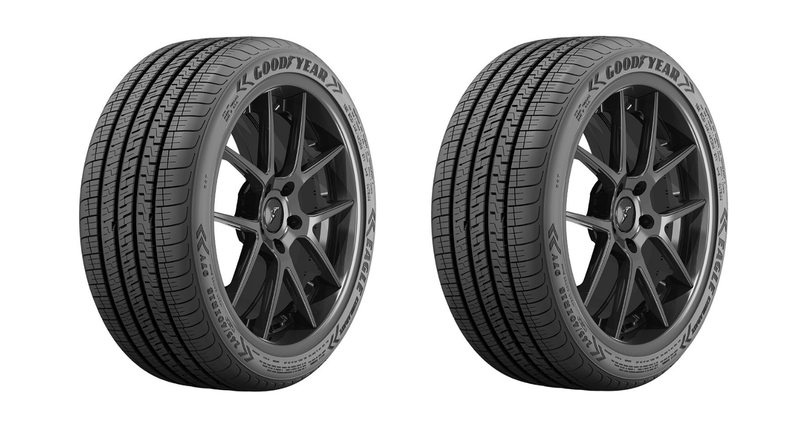 A new built-in wear gauge tool and a high performing tread compound are just two of the features of Goodyear’s newest ultra-high-performance all-season product. The Eagle Exhilarate is the result of more than three years of research and testing and will be offered in 36 W or Y speed rated sizes. Targeting a passionate, well informed consumer, the Exhilarate features a bold appearance style that matches the vehicles that this consumer demographic drives. The Exhilarate wear gauge tool is strategically placed in eight locations around the tire, enabling consumers to easily measure both tread depth and vehicle alignment. A new, all-season tread compound featuring an optimized combination of high-performance polymers, fortified with traction resins for superior handling and traction in wet, dry and snow conditions. The Eagle Exhilarate is the replacement for the Eagle F1 Asymmetric All-Season and will be available starting in April 2019. Potential popular vehicle fitments include the Ford Mustang, Chevrolet Camaro, BMW 3-Series, Porsche Cayman, Dodge Challenger, Audi A6, Cadillac CTS, BMW 5-Series, Mazda 6, Porsche Cayenne, Mercedes E-Class, Lexus LC.